Sorry I’ve been absent from the blog for awhile. 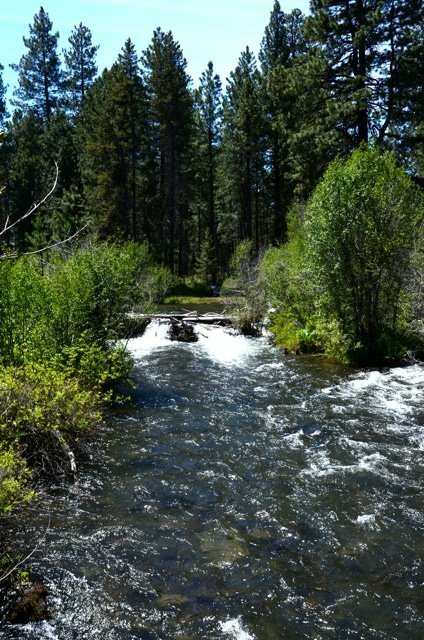 We went away to Bend Oregon for a few days and I’ve had a hard time getting back to the everyday tasks of life. It’s nice to get away and not to think about anything at all. Usually when we travel we are visiting family, working, or trying to cram as much activity as possible into discovering a new city. 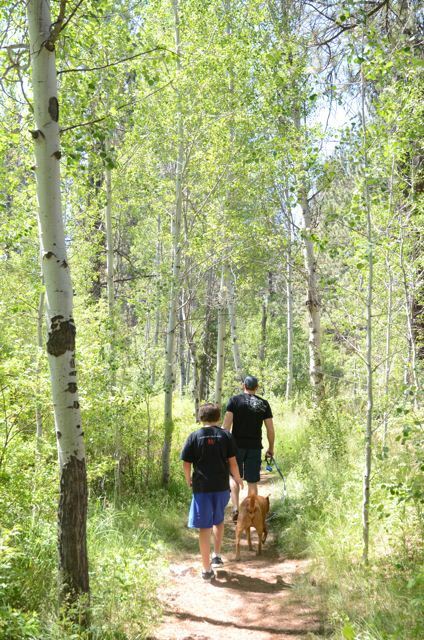 We spent our days hiking and taking in all the natural beauty that Bend has to offer. It’s the first vacation that I’ve taken in a long time where I felt that it was truly relaxing. Anyway, I’m back in the swing of things and I’ve got a few posts lined up and ready to go! This time of the year in the garden is when the magic starts to happen. 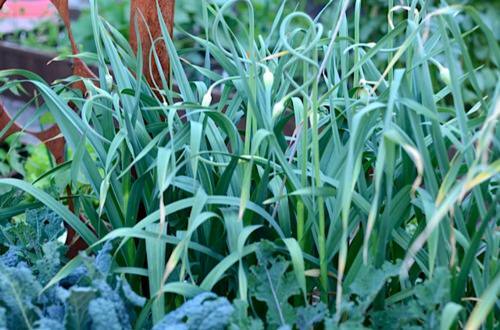 After weeks of waiting for signs of life, the garden is starting to produce like gangbusters. The spring and summer vegetables are oddly reaching maturity at the same time. The peas are ready faster than I can pick them and I picked my first summer squash this morning. 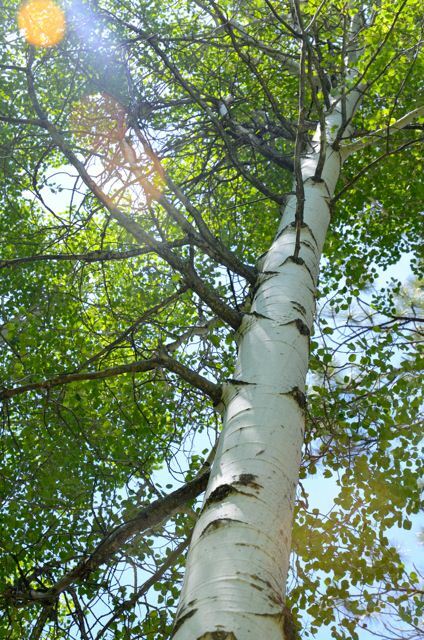 Going out into the garden is like a treasure hunt, never knowing what will be ready to turn into a delicious dinner. It’s so gratifying to turn the soil, plant a few seeds and watch them grow into something that you can share with family and friends. Pretty cool, isn’t it? 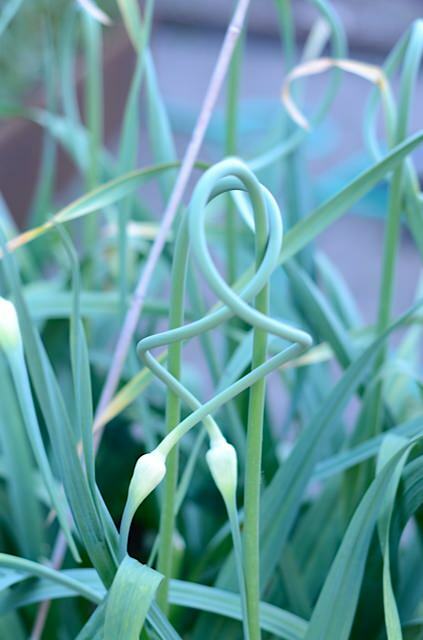 This is the garlic that is growing in my garden, I love the way they are intertwined. 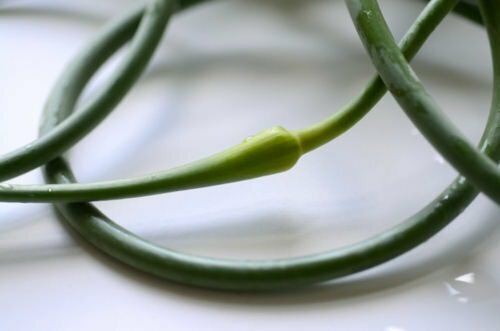 Scapes are such a cool alien looking little item, and they each have their own little personality. 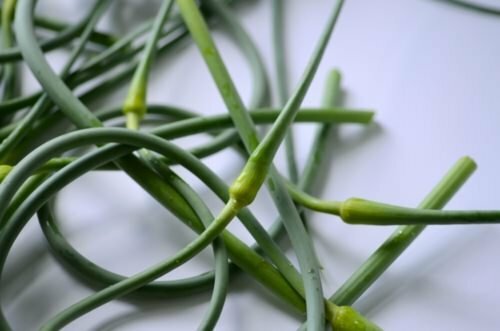 Scapes are the stem of hardnecked garlic and lucky for us, they need to be trimmed before they flower or the garlic will focus all it’s energy in the flower and not the bulb where you want it to be hard at work. I have always be a little perplexed as to what to do with them but this season thanks to the internet, I have finally figured out some great ways to prepare them. They have a mild garlicky flavor and are best enjoyed simply. 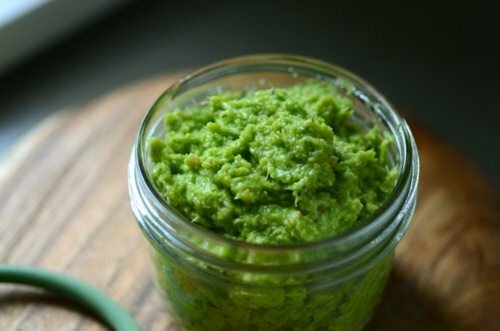 They are delicious roasted or quickly sauteed and make the most amazing pesto. I made a vegan version here, but you can easily add 1/3 cup of parmesan cheese for a richer flavor. Cover the top of the pesto with olive oil and refrigerate for a few days or freeze for up to 3 months. 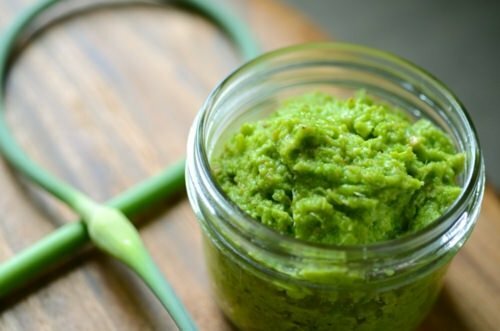 In the next few days I’ll share some ways that I like to use my scape pesto. Stay tuned! 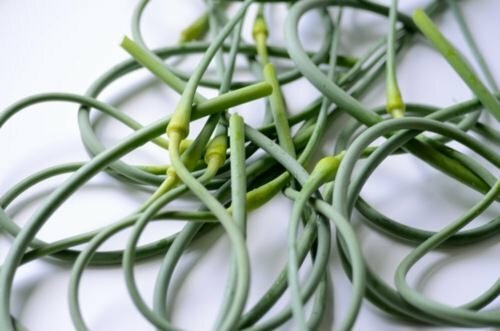 Put the scapes, herbs, hazelnuts, lemon juice and half the oil in a blender or food processor. Pulse to incorporate all the ingredients and then slowly add the rest of the oil. Taste and check the texture, you can add more olive oil if you’d like it thinner. It should be really bright and the flavors should really pop, make sure you add enough salt to really balance out all the flavors.